It’s said that kitchens sell houses and that’s because they are the heart of the home. Family dinners, holiday cooking, homework- there is so much living that goes on in a kitchen. When clients come to us to begin a kitchen renovation project, we walk them through the process so they feel confident in their decisions before we break ground. Frequently, clients are worried about spending too much on a renovation project only to not see a return when it’s time to sell. There are few areas of your home where you’ll really get the most bang for your buck starting with the kitchen. Numbers vary, but kitchens renovations can often return more than 100% of the investment (source). While small kitchen renovations can pay off, but we would suggest tackling all of your wish list if you’re going to undergo a renovation. Better to deal with the disruption of remodeling all at once rather than in smaller chunks, if you’re budget allows it. If you’re not planning on moving anytime soon, plan your kitchen renovation around what will make you happier. Have you been pining away for a six-burner gas range, a convection oven, or bar seating? Focus your dollars on design elements that will make your home more enjoyable for you now, rather than trying to appease the buyers of the future. When you’re pondering your dream kitchen, don’t forget that it is one of the most heavily trafficked areas in your home. The materials you choose for your kitchen should be both beautiful and durable. Marble might be a tempting choice for a countertop, but it is extremely porous and susceptible to stains. A better countertop choice would be polished concrete, soapstone, or quartz. Additionally, flooring is an important consideration. Because you’ll spend a lot of time on your feet in the kitchen, your flooring should be functional and attractive. Tile and concrete floors are uncomfortable to stand on for long periods of time. Hardwood floors, accented by kitchen rugs, are easy to keep clean and easy on the feet. Avoid choosing really expensive finishes to keep costs down and increase the value of your investment. A lot of kitchen renovations revolve around making the space more open and accessible for entertaining. We recommend adding in-kitchen or kitchen adjacent dining and seating space so guests can interact with their hosts during cooking. Also, to keep kitchens smelling fresh, you would definitely want to install a vent hood and maybe even a ceiling fan. A bay window has the double benefit of adding natural light and ventilation to the space. A kitchen that is open to a bigger living area is a really desirable feature when it comes time to sell. I think most people agree that a well thought out kitchen renovation will always pay off in the end. When we start a remodeling project with our clients, we work with them to make all of the design and material choices up front prior to construction so that we have a firm handle on what they want and the budget. 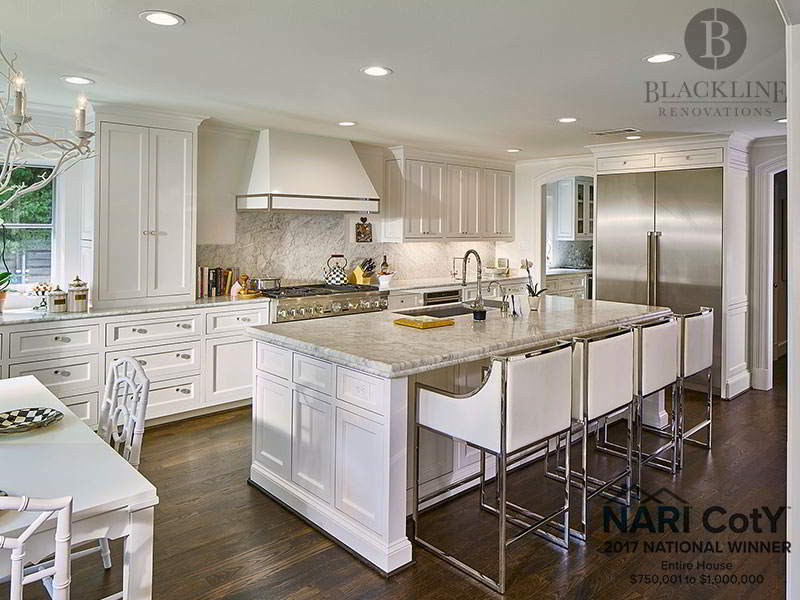 With a design-build approach to renovation, clients get kitchens they love without any surprises or stress.